Aug. 13th Two-Thousand-and-Eighteen was a very special night here in Petaluma, Calif.. Our souls were blessed to have another beautiful NorCal evening but most of all our ears were blessed with tantalizing tunes provided by Sol Development and Soul Rebels featuring none other than GZA from The Wu-Tang Clan! Local favorites and NPR Tiny Desk Contest Contestant, Sol Development from right here in the bay, kicked the night off and brought a crowd that was ready to boogie to the dance floor. Having played the TapRoom earlier this spring they really know how to get the crowd going. All that boogieing down certainly made the all new Hazy Memory Ale go down quite nicely, and was a smooth pairing for their smooth sound. It was so great to have Sol Development back, do yourself a favor and check their #TinyDeskContest entry here. 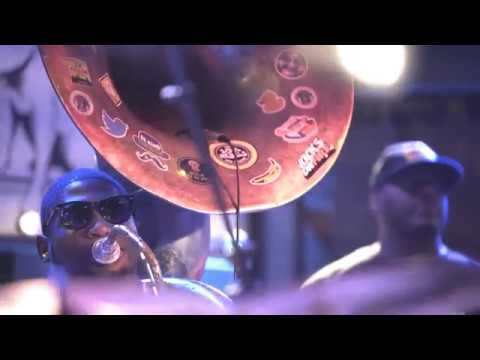 As the sun set and as the dance floor was getting a brief break from the foot work, we quenched our thirsts and then Soul Rebels took the stage to unlock our minds with their juicy New Orleans jazz sound. Casting their big brass sound into the night they got every person in the audience on their feet, and enjoying some fresh brews. Just as the crowd started to work up a big thirst from the beat, Soul Rebels were joined by special guest GZA! The energy at the LaguMiniAmphitheaterette was set to maximus for this special pairing of GZA and Soul Rebels. The roar of the crowd after the show cut the usually still Sonoma County Summer air open like liquid swords, with cheering and of course more cheers! Another perfect evening #LiveAtLagunitas.